Is This The Day The World Ends? The Black Widow flees from agents of the terrorist group the Sword of Judgement, who she has been investigating. 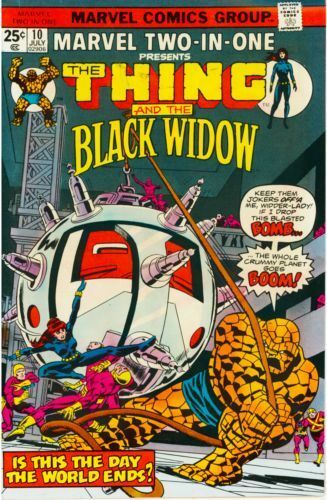 When she crashes into the Thing who is out on a walk with Alicia Masters, the terrorists take the Black Widow and the Thing and put them aboard their helicopter. They are taken to the Sword of Judgement's base, which is located in the middle of the Atlantic Ocean. There, they are brought before the Sword's leader, Agamemnon, who tells them of his plan to detonate a giant nuclear bomb that would cause radioactive tidal waves to wipe out both North America and Europe. Agamemnon then has the two locked up in a cell rigged to keep even the Thing in. However, the two heroes manage to escape and race against time-fighting off the members of the Sword of Judgement in a bid to stop them from detonating their bomb. After a final battle between Black Widow and Agamemnon, Agamemnon is defeated and the bomb deactivated. Black Widow calls in SHIELD to collect the terrorists, and she and Thing decide to celebrate their victory as they wait for SHIELD to arrive.